What is Proof of Principle? Why do we need Proof of Principle? Although we have produced over 1000 bespoke automated solutions across a variety of industries, each customer’s product is still unique to us. Our engineers can pull a vast range of knowledge from all of these projects, however we need to ensure the product and process is proven and robust. Additionally, automation complexity is growing, with the pressure of higher throughputs, higher efficiencies and shorter lead times being ever more apparent. By identifying the processes which are of high-risk, we can formulate a proof of principle phase which will identify the feasibility and performance of any given process. Low Risk – The machine design commences with critical processes proven and documented in the functional design specification. On time Delivery – Identifying and addressing the ‘unknowns’ in the project at this early stage means we can confidently calculate a lead time that we can deliver. Product Design – If the Proof of Principle work is unsuccessful, we need to identify other means and methods of undertaking the process. One key area here could be to work with you to design your product for automation and therefore simplify the process. Medical Device Tolerances – Some medical device assembly work to extremely tight repeatable tolerances. Therefore we need to ensure that we can achieve these assembly tolerances with a robust and proven method prior to machine design commencing. Product Marking and Traceability – Product traceability has never been so important, therefore getting the right solution is critical. We can run trials with different marking methods to ensure that the right method is selected. New Technologies – There are new technologies being released weekly and we are often including these in our solutions. To ensure we provide the best solution we often have to try out technologies to ensure they provide the result you and us want to achieve. Unusual Products – Not all products are consistent or are simple to handle. We need to work with you closely to obtain your product expertise and prove that our method works. The Proof of Principle is just as important as the final machine. Get this right and mitigate risks and you have a good chance of a successful project. Both supplier and the client need to fully engage to ensure the risks are highlighted and understood. Spending time, in the beginning, can save weeks and sometimes months. Sometimes the Proof of Principle can fail, but failing smart and learning from this is what can make all the difference. 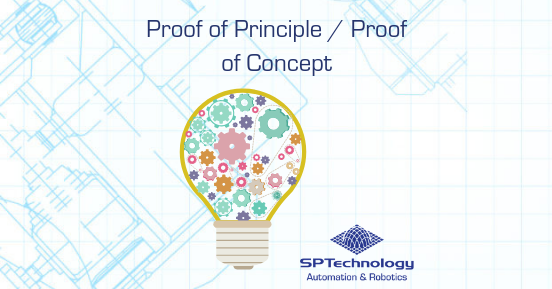 For more information on how we identify and progress a proof of principle phase, please don’t hesitate to get in touch with the team here at SP Technology.